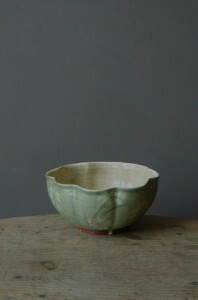 James Burnett-Stuart graduated from the Harrow studio pottery course in 1988. The red earthenware clay which James employs, is often textured, leaving marks that will be softened by paler coloured slips and glazes, which he sometimes applies twice. Many of his freshly thrown pots are immediately and deftly altered, creating subtle pillowed forms often with undulating rims; for example the scalloped dishes and jugs. James’ pots convey a warm serenity. They are both rustic and sophisticated at the same time. His pots are a joy to behold in everyday use in the home. James also paints and makes great wooden spoons! Wobage is delighted to invite James for two days of demonstration and tutorial on the Earthenware throwing and slip decorating course, alongside Patia in July 2016. For more information please visit James own website.